For many dog owners, the greatest doggy burden on their bank accounts are regular veterinary office visits that can cost anywhere from $82 to $165 dollars. Many people believe they are getting a discounted price at places like PetSmart and ASPCA but end up paying hundreds more than they expected and have to return for costly follow-up visits, said Spataro. 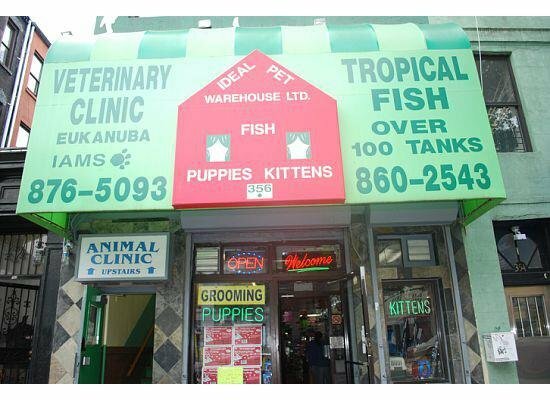 Spataro’s love for animals and love for his East Harlem neighbor’s prompted him to open up a veterinary clinic atop his pet shop, 15 years ago. Located on 116th Street between First and Second Avenues, Ideal Pet Veterinary Clinic provides veterinary medical services for only $35 dollars. Embedded within the heart of El Barrio, Ideal Veterinary Clinic opens its doors four times a week to the residents of East Harlem and surrounding neighborhoods. From ear and eye infections to vaccinations to micro chipping, Spataro’s veterinary clinic accepts all customers at a small price. Currently, the median household income in East Harlem is approximately $31,444 dollars, according to the U.S. Census Bureau. Many East Harlemites live paycheck-to-paycheck and struggle to pay the rent each month, which makes owning a dog extremely burdensome on their livelihood. For East Harlem pet owners Mary Ann and John DiSalvio, affordable veterinary clinics like Ideal Pet Veterinary Clinic are necessary for caring their pets and their bank accounts. Without affordable veterinary options, the couple said they wouldn’t be able to properly care for their dogs’ needs. “We love them and we’d do whatever we had to for them, but it’s too expensive. There has to be more options out there. More doctors have to participate in helping the situation like Ideal,” John DiSalvio said.